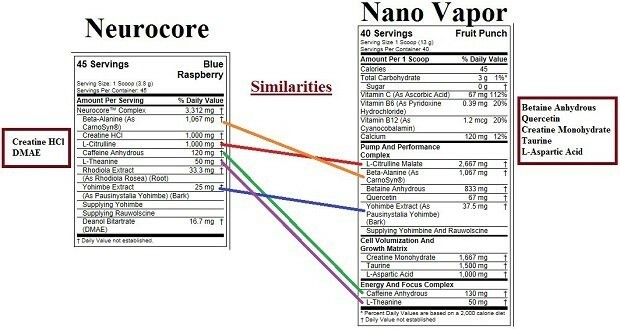 Here is the pre workout supplement comparison of Neurocore vs. Nano Vapor, both manufactured by Muscletech. This supplement review is brought to you exclusively by Best Workout Supplements Blog, keeper of the official Top 10 Pre Workout Supplements for Men list. This post was inspired by the overwhelming requests we received asking for a comparison between these two powerful pre workouts. In addition, this is a response to many fans asking why Nano Vapor made an appearance on the top 10 pre workouts list and not Neurocore. So excluding the countless reviews we tally while making our final decision on the top 10 list; here is the factual, definable evidence pointing out the differences between these two great pre workout supplements! Note: if you scroll down you will find our previous comparison between the former Neurocore version and Nano Vapor version. As well, you can read our Vapor X5 Review here where we compare Vapor X5 Next-Gen with Neuro and Ripped. If a picture is worth a thousand words, then this will make the differences between Neurocore and Vapor 5X Next-Gen quite clear. As you can see, Neurocore is the minimalists template upon which Vapor 5X is built. Think of Neurocore as the cheap, base model, whereas Vapor 5X is the more specialized and expensive version. Granted, neither is premium by any standard. We will begin with the strongest evidence available for determining the difference between Muscletech Neurocore and Nano Vapor pre workouts – the ingredients. Below we have prepared a crude yet effective comparison of ingredient labels. In this figure we have identified similarities as well as differences. 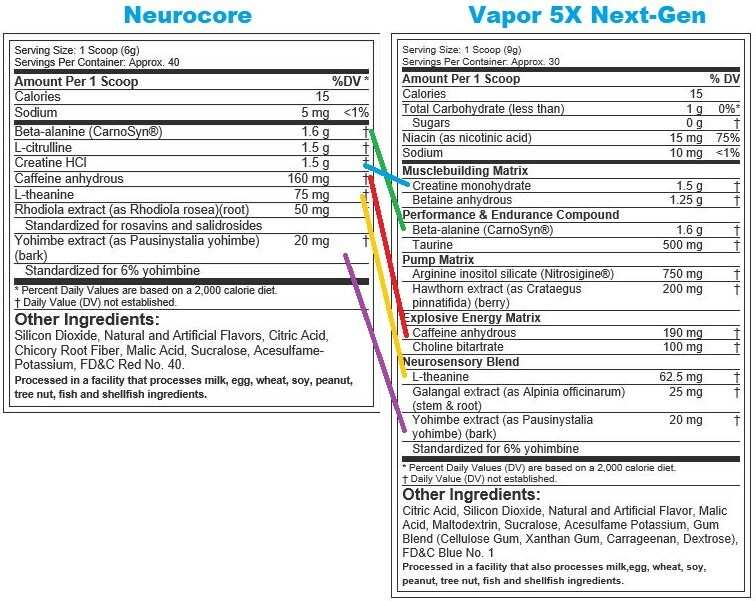 As you can see above, the pre workout Nano Vapor contains nearly all of the ingredients within Neurocore with the exception of DMAE (a stimulant), and a switch in creatine sources. This difference has been noted by Neurocore users, specifically feeling the instantaneous creatine HCl availability and DMAE focus. In addition to containing over 90% of the same ingredients found in Neurocore, Nano Vapor also contains – Betaine Anhydrous, Queretin, Taurine, L-Aspartic Acid, and Creatine Monohydrate. This difference may not seem huge, but Nano Vapor’s exclusive ingredients do support a cleaner energy production via metabolism support. In addition, the Betaine and Creatine Monohydrate support muscle growth more-so than Neurocore. All of this and more leads to Nano Vapor making the list, and not Neurocore. Currently, we believe that Nano Vapor is one of the top pre workouts picks for men trying to burn fat and build muscle at the same time. In our experience taking Nano Vapor, there is a ‘heating’ sensation that you wont find in other pre workouts. This Thermogenic activity results in more calories burnt and an overall different workout experience. On the other side, we cannot forget that Neurocore is an extremely potent pre workout that comes in a very small serving size. Each of these pre workouts have benefits. This evidence, alongside the countless pre workout reviews and testimonials by bodybuilders across the United States is how we have ranked these pre workouts. We were more than happy to provide you with this information, and hope that you stay in touch with us in the future for all of the best workout supplement reviews, comparisons, and rankings. Feel free to browse through the rest of our site; we have a lot to offer.